Deborah has been involved with the veterinary profession for nearly 30 years and has experience in specialty, emergency, and general practice management. She earned an MBA with a concentration in business management and completed her PhD in Organizational Leadership. Deborah is a Certified Veterinary Practice Manager, accredited from the Veterinary Hospital Managers Association. She devotes much of her time to community service activities and holds memberships with several veterinary-related associations and organizations. Deborah is a national speaker, founder of Austin City Unlimited Veterinary Management Symposium, and published author of practice management/professional development articles. She enjoys spending time with her family as well as performing with her bands, the LaxaTones and the No-Lo Prophets. Stuck. Many of us can relate to feeling stuck when we continuously repeat old processes, live in unhappy relationships, or work in unhealthy environments. We may know that we are unhappy but often stay the course because we don’t know how to make successful change happen. We become comfortable with the familiar misery. This article discusses the steps necessary to get unstuck and realize forward momentum by making successful change happen. This topic was introduced at the 2016 NAVC Conference and will continue at the 2017 Conference. Stuck: What Does It Mean? Everyone gets stuck at some point in life, whether on a personal or professional level or a blend of both. Being stuck is also known as being in a rut, frozen, trapped, or getting the same unwanted results over and over (FIGURE 1). One indicator of being stuck may be one’s happiness level. Sometimes we may not be happy and we don’t know why. Other times, we may know why we are not happy but don’t know where to begin to make change happen. There may be still other times when we know we aren’t happy but just can’t “go there” or can’t imagine doing all the work that it takes to realize better results. Can you think of a time when you were stuck? If so, how did you deal with it? Although we may believe somewhere deep down inside that we would benefit from change, there are many things that can get in the way. Some reasons may be clear to us, but more often, self-reflection is needed to understand what is keeping us stuck. FIGURE 2. Familiar misery and missed opportunities. Our Brains: Friend or Foe? Our brains, as magnificent as they are, sometimes prevent us from making quick and easy changes. We can become rooted in our habits and routines, which in turn make pathways in our brain. On a daily basis, we often travel the same route to our jobs, order the same coffee drink, and make other similar regular decisions. What happens when we have to go outside of our daily routine or comfort zone? Many programs developed to help manage change initiatives are available. Philosophies differ concerning the amount of time needed to realize effective change. Does it take 30 days, 60 days, 90 days, or even longer? The answer is, it depends. Many variables must be considered when launching a change initiative, such as: What do we want to change? How long have we been doing it this way? Does it involve professional or personal change? Is it group change or individual change? Is it turning off a light switch when leaving the practice or moving from paper files to electronic medical records? How and where do we start? Who is part of the process? How do we make long-lasting change? These are just a few items to consider when developing effective change that sticks. What are some of the barriers that have kept you from getting unstuck or making change happen? One example of a well-known change program was developed by change expert John Kotter.4 One of the first comprehensive change management programs, this 8-step program is especially useful when trying to make group change. Pull together the guiding team. Develop the change vision and strategy. Communicate for understanding and buy-in. Kotter’s steps are a result of decades of research, and the key to this methodology is that every step must be addressed. Shortcuts often leave critical items unaddressed, resulting in gaps in achieving change success. Sometimes it is necessary to revisit a previous step and make adjustments to realize change that sticks. Other examples of change systems can be seen in weight-management programs and fitness clubs. Each has a strategy concerning how to make change happen and achieve long-lasting results. Although everyone has different stories, interests, and experiences, there are 4 common steps to explore to start getting our lives unstuck. This is a difficult first step. In our profession, we are known to be helpers and givers to many, often at our own expense. Stopping to take time for ourselves is frequently difficult because we usually are very busy, even working after hours or bringing work home with us. Taking the time to stop or pause is the first critical step. The next necessary but difficult step is to take a deep breath, exhale, and get ready to really listen to what it is that you want to change. Honestly listening to your heart and head will help you understand what is truly holding you back from moving forward with your goals. In this step, you will identify the results you are getting now and what different outcomes you would like to realize. By listening to your heart and your head, you’ll explore your dreams and goals and start to identify the steps necessary to make them happen. This is the step where you take action and apply the strategies you developed in the listening step. This should help create new pathways and movement toward realizing new outcomes. Although our life experiences vary, we often have many of the same feelings and fears when making changes. Here is an actual account of a veterinary professional making change happen and getting unstuck from both a personal and professional perspective. Jerry, a veterinary technician in a general practice, was married with children. The marriage was becoming increasingly unhealthy. Jerry and his wife seemed to be growing apart and no longer demonstrated the kindness and generosity they had earlier in their relationship. Jerry also had musical talent that he felt was going nowhere. As a result, Jerry was becoming more and more depressed. He became short-tempered at work, and his absenteeism increased. Jerry was just shuffling through his days and eventually realized that his job was in jeopardy. He was stuck. Have you realized success in making change stick? What was the key to your success? 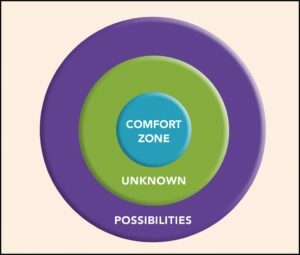 Jerry realized he had to step out of his comfort zone to understand why he felt so stuck and how the disastrous ripple effect influenced the rest of his life. He realized he had to, as they say in the airline safety demonstration, put his oxygen mask on first before helping anyone else, specifically his wife and family. Are you stuck with something in your life? 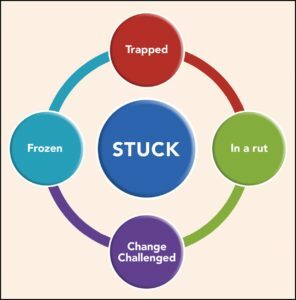 Remember the 4 steps to getting unstuck and start the change process. Find a quiet space where you can just stop, someplace where you aren’t pulled in several directions. This is difficult, but it is the necessary first step in learning about yourself and what movement you’d like to make. Once you’ve found your space, breathe deeply, then exhale. This works like a reset button and helps you become more present and ready to hear and acknowledge what you are thinking and feeling. We have goals and dreams of the ideal scenarios. These come from our heart, or feeling. Then we have the plans, pathways, and how-to’s. These come from our head, or thinking. Listening to both the heart and head helps avoid short-changing possibilities and missing opportunities. Write out your reflections and ideas and share them with those you trust and who are open. Take action on your change initiative. There will be many lessons throughout this process, and they may require you to tweak some of the plans and pathways to realize your goals and dreams. Keep the forward momentum by evaluating the results frequently. Write down both the process and the results you have achieved. Give yourself some kind words and thoughts. Credit yourself for all that you have done and all that you will do in the future. He realized the best way he could listen to himself and communicate with others was through the power of music, which was another casualty as he became stuck. He wrote and recorded a song called “In This Together” and shared it with his wife. They began having open discussions about how both would contribute to the health of the relationship. He decided to leave the general practice and accepted a position with a veterinary radiology group that was closer to home and provided better opportunities for career growth. In his downtime, he built a home recording studio so he could reconnect with his joy of music while still enjoying quality family time. This story of change took a significant amount of time and required going to uncomfortable places, but the payoff for Jerry was tremendously positive, both personally and professionally. Is getting unstuck easy? No. Can it be done? Absolutely. It’s truly your choice if you want to be part of changing outcomes in your life. Whether your story of being stuck is personal, professional, or both, if you want to achieve better results, you must do the difficult work. It’s also important to note that we don’t get stuck and unstuck just once in our lives. The more we develop our self-awareness and understanding of why we’re stuck, the better we’ll get at making change happen—perhaps even becoming happier along the way. Do you have a story about being stuck? How did you deal with it? Visit our Facebook page (facebook.com/todaysveterinarynurse/) and share it with us and your colleagues! Achor S. The Happiness Advantage: The Seven Principles of Positive Psychology That Fuel Success and Performance at Work. NY: Crown Publishing Group; 2010. Buettner D. Thrive: Finding Happiness the Blue Zones Way. Washington, DC: National Geographic Society; 2010. Goleman D. The Brain and Emotional Intelligence: New Insights. Northampton, MA: More Than Sound LLC; 2011. Kotter JP. Leading Change. Boston, MA: Harvard Business Review Press; 2012.